When you are searching for a minivan that will be transporting you and your family on a daily basis you need it to have versatile cargo and passenger space that will help with your ever-changing daily demands. The 2019 Dodge Grand Caravan and 2019 Toyota Sienna are two of the most attractive and accommodating minivans on the market today. Both of these minivans offer athletic exterior appeal as well as flex-folding seats that will help with seating and storage as well as efficient performance under the hood. Learn more about the similarities and differences between the 2019 Dodge Grand Caravan and the 2019 Toyota Sienna right here below. As you can see from the chart above the 2019 Grand Caravan and the 2019 Sienna have standard V6 engines that supply them with hearty horsepower but the Dodge Grand Caravan’s standard engine delivers a slightly more powerful towing capacity. With standard seating for seven people the 2019 Grand Caravan and the 2019 Sienna have plenty of space for everyone to comfortably fit inside and the 2019 Grand Caravan offers more standard front row legroom than the 2019 Sienna does. Both rear rows of seating in the Dodge Grand Caravan and the Toyota Sienna have split-folding capability for optimal cargo and passenger convenience. You will find a large color touchscreen display inside the cabin of both the 2019 Dodge Grand Caravan and the 2019 Toyota Sienna and although the Sienna’s touchscreen measures 7” and the Grand Caravan’s is only 6.5” the Dodge Caravan also gets equipped with a 40 GB Hard Drive so you can store all of your favorite music right in its infotainment system. There is no internal hard-drive storage in the 2019 Toyota Sienna. Bluetooth® and USB Port connectivity are standard equipment for both the 2019 Dodge Grand Caravan and the 2019 Toyota Sienna so you can stream and straight connect your smartphone to their infotainment systems. It is a hard-earned victory for the 2019 Dodge Grand Caravan over the 2019 Toyota Sienna but thanks to its better standard and available specs and features it takes the checkered flag in style ahead of the 2019 Sienna. 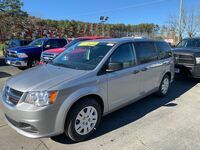 You can take the 2019 Dodge Grand Caravan for a test drive today at Cowboy Dodge in Clinton, AR to experience everything that it has to offer for yourself. 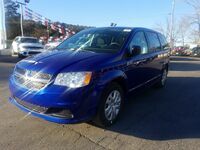 Interested in a 2019 Dodge Grand Caravan?